Ansel Adams, the iconic American photographer, is famous for having said, “No man has the right to dictate what other men should perceive, create, or produce, but all should be encouraged to reveal themselves, their perceptions and emotions, and to build confidence in the creative spirit.” Isn’t that notion what is in the real guts of a truly great photograph of the natural landscape? 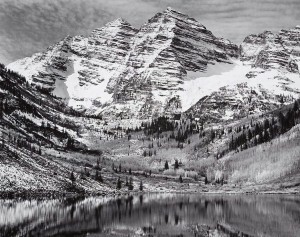 When I think about Adams’ famous photograph of the Maroon Bells (right here in our backyard), and when I look at it now, I can’t help but think about the famous artist’s intention. Was Mr. Adams onto something much greater than merely making a beautiful photograph? Was he, in fact, saying something about the clarity of consciousness achieved when mankind is in harmony with nature? Look again at the photograph and think about what you see. There is no alteration of the landscape, no manipulation, and no real projection of the artist at all, just a clear representation of what the photographer saw on that crisp wintery day in 1951. Doesn’t sound much different than the above quote… We are not told what or how to think, but instead we are encouraged to find and nurture our own voices in the reflection of nature and in each other. There was a lot going on in Aspen in the early 1950s and I don’t think it was a historical coincidence. The Aspen Institute was founded by Walter Paepcke in 1950, and in 1951 the Institute sponsored a national conference on photography with a list of attendees and participants including Ansel Adams, Dorothea Lange, Ben Shahn, Berenice Abbott, and other significant practitioners of the art form. Paepcke envisioned a place “where the human spirit can flourish” by bringing together thought leaders of the time – artists, business leaders, executives, educators, and others – all of whom who were in some significant way contributing to the modernization of America. Aperture, the seminal, nearly academic photography magazine was founded by photographers Minor White, Ansel Adams, Dorothea Lange, and others in 1952. (Minor White edited the magazine from its inception until 1975). It has been rumored that the idea to create Aperture was germinated during that conference in 1951; I couldn’t verify that statement during my research, but it is certain that Paepcke and Adams shared a passion for critical dialogue. Adams proved to be the most influential American photographer of the 20th century. Likewise, Paepcke and his wife Elizabeth are credited with coming up with the Aspen Idea: the synergistic nurturing of mind, body, and spirit that today is still at the core of the Aspen community. So, what’s all of that got to do with us here at Valley Fine Art you ask? We are committed to showing the best art documenting the ever-changing American landscape from the 1800s to the present. What we find is that icons like Walter Paepcke and Ansel Adams pursued truth through critical dialogue right here in our hometown. 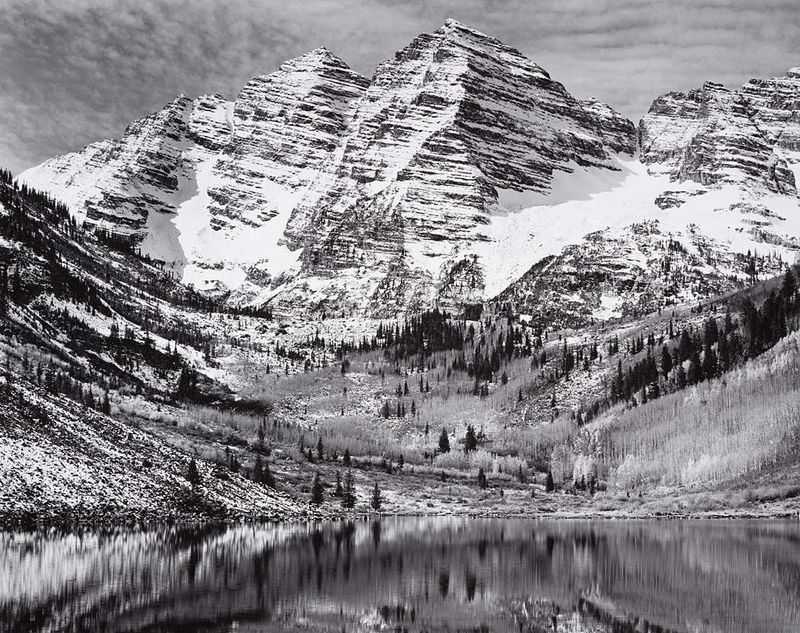 They give us a clue about how to do it and encourage us to carry on, to ask questions, and most of all to let the work speak for itself—just like Adams’ Maroon Bells and Paepcke’s Aspen Institute. Think of it as a think-tank for your soul; never to judge but instead to inspire your own revelation.